I'm talking about Canadian violinist James Ehnes, whose latest project, a CD/DVD called Homage, involved performing on nine violins and three violas by the above makers, all from the collection of Dave Fulton. In fact, the project is more of an exploration, with Ehnes speaking about each individual instrument, then showcasing it with music he chose specifically to feature that instrument's special qualities. "Homage" was just nominated for a JUNO award, of which Ehnes has already collected five. He won a 2008 Grammy for his recording of the Barber, Korngold, Walton: Violin Concertos with Bramwell Tovey and the Vancouver Symphony Orchestra, and among his numerous recording projects are the Niccolo Paganini: 24 Caprices For Solo Violin, an a CD of all Mozart's works for solo violin and orchestra.. But somehow Ehnes has a special knack for finding what is special in a violin, for illustrating in both his words and his playing. This is no accident; Ehnes may have been destined to be a connoisseur of fine fiddles. He certainly started thinking about the instrument he played – and making important choices – at a young age. Laurie: What was your very first violin like? James Ehnes: I received a violin for Christmas a month before my fifth birthday, and I think it was a half-size. It was too big, so I got a quarter-size a few weeks later. I had been wanting a violin for some time; there was always a lot of music in my house. My dad is a trumpet teacher, and my mom has a ballet school. To keep me out of trouble, they would prop me up on the radiator next to the stereo speaker, and I would listen to music. So I wanted a violin, and I was so excited when I got it. I remember taking it out and having a momentary flush of insecurity because I didn't know which hand did which thing! I guessed right the first time, the violin goes in the left hand, the bow goes in the right hand. Still, I was so concerned that I would forget this, that for the first several weeks I always practiced in exactly the same spot in the house, where I knew I had my orientation correct. Laurie: Tell me a little bit about your journey to procure a fine instrument. 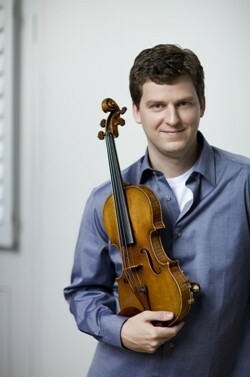 James Ehnes: When I was about 12, I was lucky to get a beautiful violin, a three-quarter-size. It wasn't terribly expensive, an old German violin. I've got such sentimental feelings toward it, I still have it. It was a really beautiful-sounding instrument, a beautiful antique. It was probably that violin that got me excited about violins. I became aware of how different they can be, and how special the right violin can feel. Then I got very lucky: When I was ready to start playing a full-size violin, the Manitoba Arts Council, (I grew up in Brandon, Manitoba), was starting up an instrument bank. They had some money, and they organized a competition for young Manitobans to get grants to purchase the first instruments for the instrument bank. I played this competition, and I won. So they said, we've got $25,000, go find a violin. It was a pretty extraordinary thing. With my teacher's help, we looked at a lot of different instruments and settled on a Riccardo Antoniazzi. It's amazing that a Riccardo Antoniazzi was worth only $25,000, not that long ago. To this day, that's actually my violin. Later on the arts council unfortunately had to shut down this instrument program. They donated the instruments to various universities throughout the province, and we arranged it in such a way that they donated the Antoniazzi to Brandon University in my hometown, where my dad works. I was able to purchase the instrument from the university, and then the university took that money to buy some other instruments. So I have that violin to this very day. Laurie: That sounds to me like unique opportunity, at a young age. James Ehnes: It really was. It was shortly after getting that violin that I went to Meadowmount for the first time. Of course, at Meadowmount there were 13-year-old kids playing on Gaglianos and Amatis – there was some serious money. But there were also some kids who were really struggling on not-so-great instruments, people from normal families like my own. I knew how lucky I was to have a nice violin. Then as I went through my teens, I would occasionally borrow different instruments, sometimes some really nice ones. I borrowed a Strad from a guy in Minneapolis a few times, and when I went to Juilliard, I borrowed a violin from them briefly. My next major long-term instrument was a 1717 Strad (the Windsor-Weinstein) that belongs to the Canadian government. It was donated by an amateur from Toronto. I had to play a competition (to procure that instrument) and I received the loan (of the instrument) for three years. After that, I could do the competition again for another three-year loan, but that's the end of it. You can only apply twice. So I knew it was always going to be a temporary thing. It's a beautiful violin, but it's not really so much of a solo instrument. It doesn't have a particularly big sound; it was always a little bit of a struggle to project with that instrument. I played on it for about five years, and it was during the period of playing on this violin when my career really started developing. Dave Fulton, whom I'd gotten to know during that period of time, was not particularly fond of that instrument. He thought that I needed something better, and it was during that period of time that I first saw the Marsick Strad, which I play on now. It was being sold in London. When I would go to Seattle and see Dave, I would tell him about the instruments, but honestly, it never crossed my mind, that in a serious fashion, he would have an interest in buying the instrument. That wasn't the sort of thing he did, or the kind of relationship we had at that point. But he was becoming a friend, and so I would tell him about the violin. Basically I wanted his advice on how to deal with people who might be interested in buying it, how to deal with the sellers. My heart was really fixed on this one particular instrument. Laurie: How did that come to be? Why this instrument? James Ehnes: It's actually kind of a random thing. It was being sold by Peter Biddulph, out of London, and there's a dealer in New York who works with Peter, and sometimes he brings violins back and forth, overseas. He's an old friend, I've known for years, I'd actually bought a bow from him, and he knew my playing really well. It was a very curious thing, he called me up one day and said, "You have to see this violin. This is the violin for you, you're going to love it." And of course, there are dealers who say that sort of thing every time you visit! But he knew for one thing, that there was no possible way that I could have afforded it, and I didn't know anyone who could have afforded it either, so it was not as if he was trying to make a sale, he just thought that this was something that I really needed to see. I've always really appreciated that, because I was basically the first person in America to see this instrument after it had been brought out of Russia and then gone through restoration. A 1715 Strad doesn't hit the market too often; I was just really fortunate to just know this guy and to have a chance to see it. Then of course, having seen it, it was a several-year process to actually figure out a way to get my hands on it. There was a consortium of Canadians that was interested in buying it. That looked very promising for a while, then that unfortunately fell apart. There was a Canadian auto parts company, of all things, that was thinking of buying it, and they'd gone as far as putting down a deposit, but then they pulled out of the deal. Eventually, I think that Dave just got sick and tired of hearing me whine about it. The price was very fair for what the instrument was. He was of the opinion that someone should just step up to the plate and do this, and make it happen, because it's a good violin – it's a great violin, it was a fair price, and he felt that I should be able to use it. So he bought it. And that was that! Laurie: And it's on permanent loan to you? James Ehnes: Well, he has no plans to take it back, I guess I'll say that. At some point, what Dave would really like is for me to buy it from him, so that I could really have it forever, which would be amazing. So we'll see. Laurie: That must have been awful when it was sold to someone else, like the person you were planning to marry had married someone else! James Ehnes: It was kind of depressing. It was particularly depressing because some of my friends in the business, including this guy who had shown it to me in the first place, my friend Alex, he would try to get my mind off of it. He would say, 'Come over to the house, I've got this other great Strad passing through for a couple of days...' And I'd say, 'No, it's not the same,' and I'd mope about it. Actually when I started searching on behalf of the Canadian auto parts company I'd mentioned before, the (Marsick) Strad, as far as I'd known, had sold, it was gone. So I was looking at different instruments, and I'd actually picked out a 1740 del Gesu. At that point, after I'd picked out that violin and I was pretty happy with it, I heard that this Marsick Strad was coming back on the market, and so I was really excited to get the two in the same room. That was an extremely hard decision, deciding between those two instruments. I played for a lot of people, obviously, to get as many opinions as possible, and 50 percent of the people said one, and 50 percent said the other. In the end, it was just sort of a gut thing. My roommate at the time, a cellist, had gone through all this with me. I'd bring back (instruments) to the apartment. He thought that I'd managed to pick out the most Strad-like Guarneri that I could find, and the most Guarneri-like Strad. So I was not dealing with extremes. I knew what I wanted, and it was sort of right down the center. Laurie: You put yourself through a lot to get this instrument. Is there a way of describing what it is so compelling about a fine instrument, that would make you go through all this? James Ehnes: In terms of playing the violin and having a career on the violin, one is always dealing with ...how much sacrifice are you willing to make? How hard are you really going to practice? How many weekends out with your friends are you really going to pass up, what is it worth to you? At the point when I was looking for a great violin, the concept of being the absolute best that I can be was paramount. That was the most important thing: reaching whatever full potential I had, because I was at that point where my career goals and dreams were either going to happen or not happen. There I am, getting into my early, mid-20s, and things had been going well for me, but I was by no means established. I could have disappeared pretty easily. I thought, anything I can do to get my playing better, anything I can do to improve myself as a player, as a musician...I have to do it, and I have to do it now. So trying to get a great violin was just a part of that. Looking back, there was a lot of time and effort and struggle that went into the process of getting an instrument, but in a way that was the easy part. I mean, the practicing was much harder! Laurie: Does an instrument teach you something? James Ehnes: Absolutely. Different instruments can teach you different things, depending on what you want to learn. For me, I think that the great Strads and del Gesus have a level of refinement in the sound that pushes the player constantly to be improving themselves. Sometimes it really kind of gets annoying, on a Strad, where in order for it to really ring correctly it has to be played with such precision that is just sometimes gets frustrating! (laughing) You think, is this really worth it? There are certain great del Gesus – you can afford to be a little sloppy with them, and they'll still sound great. But you start sounding bad on a Strad really quickly. That can get irritating, but I'm always so into the idea of self-improvement. I appreciate having a violin that is constantly pushing me to try to achieve greater and greater levels of tonal purity, accuracy and intonation. I always try to take the attitude that if I'm playing on a great violin that's worth millions of dollars, it's probably better than I am. I want to do my best to try to keep up with the greatness of the instrument itself. Laurie: Did you happen to read The Violin Maker? One of the conclusions I got from that book was this idea that Strads and modern instruments sound essentially the same to an audience, if fiddle players could only get over some kind of obsession or mental hang-up with Strads. But it really isn't the same experience for the player, at least it seems to me. Maybe the end product seems to sound the same to an audience, but there's some kind of give-and-take going on, there's something the Strad is giving the player that is different than another instrument. James Ehnes: If an instrument can inspire you to be better, then that will make an enormous difference in terms of the actual experience. I think that any sort of shoot-out – they're always interesting. But they're kind of foolish in a way. Laurie: Comparing this and that, you mean? James Ehnes: In theory, it's a great idea. But if you've got two different instruments, first of all, different players are going to sound different ways on different violins. For myself, I try out a lot of violins. I love it. I love trying out old instruments, new instruments, ones that are fresh out of a workshop...I've played on really, really nice violins. Do I think that I've found a modern instrument that is as great as my Strad? No. Absolutely not. And that's not a knock on some of these great violins, and it's not a knock on players who feel differently or who have chosen to play their modern copy over their old Italian. Everyone is looking for different things. If someone can show me the violin that is as good as my Strad, sign me up, I'll write the check, I'll be done with all this headache. I'll buy two! Laurie: I wanted to ask you about developing your technique. You have a technique that is superior to most, and yet, I can see you hold the violin differently than some of the conventional ways that teachers might ask for. At what point do you ignore what teachers are asking for, and just do your own thing that's working? James Ehnes: I was really lucky to have fantastic teachers who gave me a lot of freedom. I basically had two violin teachers, and they in fact were students together under (Ivan) Galamian. My teacher in Canada was a man named Francis Chaplin, at Brandon University. He died about 15 years ago. He was an amazing man, he's kind of legendary up in Canada. It's basically impossible to go to any major Canadian orchestra and not find lots of people who studied with him over the years. He was of the 'if it's not broken, don't fix it' kind of school. He could see what worked for me, and what didn't work for me. It wasn't like he just let me do my own thing and I was out on my own. I learned all my standard stuff from him. But I think that maybe some teachers get caught up in how it should be done, not taking into consideration that everybody's body is a little different. I was with people who also made me aware of the importance of being aware of my body, and how things felt. If it hurt, then it was probably wrong. My dad was always a big believer in not wasting energy with needless tension. People sometimes say, 'You're so relaxed when you play..." I'm not exactly relaxed, I'm pretty focused, but there's not needless energy being used where it doesn't need to be used. I take pride in – hopefully – the economy of effort that I use when I play. Laurie: What do you mean? James Ehnes: Sometimes you'll see these horse races on T.V., and they're all going as hard as they can, and there are fences on either side of them, but the fence is pretty wide. So I could get going off in some direction on something, and until I started getting really off track, Ms. Thomas generally would let me do my thing. She had a lot of confidence that I would figure certain things out on my own, and that the process of figuring them out was more important than her saying, "Now do it this way." Every student is different, but I did have this independent streak that both of them indulged, and both of them were careful not to mess with things that were working. There were a lot of people that I would play for and they'd say, "Oh, your thumb's all wrong, your bow grip's all wrong, this is all wrong, that's all wrong." It's funny, about 10 years ago, a violinist who had seen me play many years before told me, "Your bow grip, it's gotten so much better, who taught you? What happened?" I said, "Well, I got a better bow." The bow grip that works on a $150,000 Tourte isn't necessarily going to work on a $3,000 Nürnberger. Laurie: It's an interesting line that a teacher has to walk, between allowing someone to experiment and develop their technique in accordance with their own body, and then also, reigning someone in. Do you teach? James Ehnes: Not really private teaching, but I do a fair number of masterclasses. I find it interesting. I realize that a lot of things have come easier to me than they do to some people, but on the other hand, I think that I'm pretty analytical. Even if it's something that I can do, there's a part of me that always wants to know why, and how. It's just the way I am about things in general. I used to take my car apart. I'm really into seeing how stuff works. Laurie: How do you stay focused in performance? Do you have advice for people who get jitters before performing? James Ehnes: A major factor is just getting in the habit of doing it. People say to me, "You have such a weird life, you travel all over, and you play these concerts in front of all these people, it's so weird!" And I think, well, it's not weird to me, to me it's just totally normal. You have a weird life! You sit at a desk, and go to the same place every day...that so strange! The moral of the story: if it become normal to you, then it just feels more natural, for the mind and the body. I think for some people, it's always more of a struggle than for others. It amazes me, certain great musicians out there, every concert is terrible for them. Obviously, these are bright people. If they had the answers they would fix it. Giving oneself as much experience performing as possible is a good thing, and so is focused preparation. Sometimes, when people learn a piece, they're very focused. They have to be, they're first getting it in the hands. Then when they are actually in the preparation-for-performance phase, they get into this sort of a trance-like run-through phase. They'll run it through, every day. I gotta run it through, gotta run it through...The mind starts to get a little bit on autopilot. Then when you actually get to the performance, you think you're really prepared, but you're not prepared in that focused way. All of a sudden, you're at hypersensitivity in the mind at performance time. It's not that you start thinking too much, it's that you start thinking enough, but you haven't been doing enough thinking. And you start second-guessing yourself. I come across that a lot, people say, "I knew the piece so well, but when I got up on stage, I wasn't sure if it went here or if it went there, and I couldn't remember my fingerings or my bowings..." They're usually blaming it on their mind somehow blanking out, but I think that in a way they were blanking out on the preparation. Laurie: It's the opposite from what everyone thinks. James Ehnes: Exactly, when you actually had to think about what you were doing, you hadn't really thought about it in so long, that it seemed very far away. Laurie: How do you do that in a practice room? How do you make the focus happen? James Ehnes: I'm guessing we've all had this experience, where you're playing along, and you realize that you weren't really even listening. James Ehnes: Just stop, start from where you last knew you had your focus, and really pay attention, really listen. People who practice well can get more done in an hour than people who practice poorly can get done in a lifetime. The focus during practice sessions is so important. Too many young people get caught up in "time," logging the hours. If people can have a particular goal in mind, and if reaching that goal can take on more importance than just logging the hours, then I think real progress can start to happen. Of course, you want to make sure that the student is spending enough time to build up stamina, and build up that level of concentration. But when you are dealing with advanced students, if they're saying, "Now I'm 16, now I'm getting serious about getting into the conservatory so now I need to practice X number of hours a day..." Well, maybe you should think of it in terms of, "I want to learn this piece and the piece, by this time," that might be a more valuable way of looking at it. Laurie: I did notice in all your bios that you are married, and I wanted to ask, how do you maintain a personal life, when being a soloist is so demanding? James Ehnes: That almost gets into the question, can you divorce an artist from his art? Maybe with some people you can, but for a lot of people you can't. I know that my music-making is best when I'm happy. As much a music has always meant to me, I've refused to ever let it take away from other things that were really important to me. Which meant that from a young age I really had to prioritize. There are certain things that are worth it in your life, that you don't want to miss out on. And there are a lot of other things that are just not that worth it. It's sort of like people who watch T.V. There might be a couple of shows that you really like and you don't want to miss. But a lot of people will watch hours and hours of stuff that they're not even really paying attention to. I think that's the way, unfortunately, that a lot of people go about living their lives. technique that is superior to most,...I guess... He should have fire extinguishers mounted to his fingers. Technique and soul. James is absolutely amazing. Laurie, great article. Thanks once again for sharing with "The community"
Laurie - thank you! What an interesting, thought-provoking and useful interview! Awesome! James Ehnes is such a wonderful artist in the complete sense of the word. His music-making leaves me speechless every time I hear him. "a lot of things have come easier to me than they do to some other people." That got a great big smiley face from me!!! Thanks for a nice interview, Laurie. The part about mental focus and practicing is really great. Anyone who has a chance to hear this guy play live should do so. He sounds BETTER in person than he does on his recordings. Unbelievable. Amazing. Adjective abuse shall end here. Ehnes is the real deal. Wow. He's much more interesting of a person than I used to think. Thanks so much for this interview, they keep getting better and better, Laurie! I think Ehnes has been bumped up on my favorite artists list for sure. See, while reading the interview, Mrs.Smith left much the same comment I did! We're all loving these recent interviews. I think they can only go up after Hilary Hahn's and Ehnes's wonderful interviews. Brilliant Interview - I learned so much and it was such a joy to read! I feel like he actually sat down with me and answered all of my questions. what a great interview. lots of good insights. the DVD also features great commentary by Ehnes. Fascinating interview - especially his comments about being focussed while practising, that's something very useful to think about. I also liked reading that he has kept the violins that he started out on, nice to feel that he has that attachment to his previous instruments. Since I don't live in the USA and can't try my luck in the competition, I guess I am going to have to save up and buy this amazing looking DVD. Another great interview, Laurie - thanks for posting. I too especially like the insights into focus while practicing. In a Yogi Berra-ish type statement, "If Suzuki were alive today, he'd be rolling over in his grave" at the way Ehnes holds his bow elbow so low, left elbow so away from his body, and the left thumb almost over the G string...odd bow grip etc. However, they all result in some fantastic technique. His interview remarks seemed to address this as having tolerant teachers...For those of us that do teach or judge, may this serve as another ingredient for our bags of prudence. I agree, Peter, there's a real art to knowing when to "correct" something as a teacher, and when to let something be.